47 Ronin retells ancient Japan’s most enduring legend. 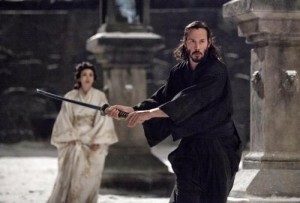 The action adventure movie stars Keanu Reeves (The Matrix) as Kai, who joins Oishi (Hiroyuki Sanada, The Wolverine), the leader of 47 outcast samurai whose master was killed and dishonored by a treacherous overlord. Together they seek revenge and try to restore honor to their homeland. ThePG-13 film is the first by director Carl Rinsch and was written by Chris Morgan (Fast & Furious 6) and Hossein Amini (Snow White and the Huntsman). Moviegoers liked it better, but were still mixed, giving it 55%. 47 Ronin grossed an underwhelming $38 million in wide release in theaters.